Religious factors are at play in public views about some, though by no means all, biomedical topics. For example, there are differences between those who attend worship services regularly and those who do not when it comes to views about the appropriateness of changing a baby’s genetic makeup. But there are no such divides when it comes to views about the appropriateness of bioengineering artificial organs. Religious groups tend to hold similar views about whether childhood vaccines should be required or left up to parental choice; white evangelical Protestants, however, are more inclined than others to say parental choice should determine whether a child is vaccinated. When asked about their views towards changing a baby’s genetic characteristics to make a baby more intelligent, an overwhelming majority of U.S. adults (83%) say this would be taking medical advances too far, while 15% say doing so would be making appropriate use of medical advances. Majorities of all major religious groups say genetic modification for this purpose would be taking medical advances too far. The vast majority of white Catholics (91%) and Protestants (87%) say changing a baby’s genes to make a baby more intelligent is taking medical advances too far. A somewhat larger share of Hispanic Catholics (29%), like Hispanics overall (24%), say this would be an appropriate use of medical advances. The unaffiliated also are a bit more likely to say this is appropriate (25%), although a 74% majority says it would be taking medical advances too far. Eight-in-ten adults who attend religious services less than weekly say changing a baby’s genetic characteristics to make the baby more intelligent would be taking medical advances too far, an even larger share (88%) of adults who regularly attend religious services say genetic modification for this purpose would be taking medical advances too far. Opinions about this issue vary by religious group. 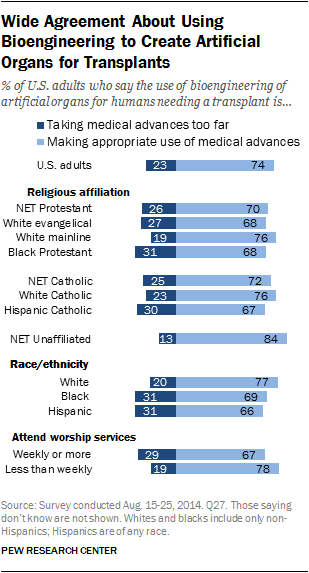 Some 62% of white evangelical Protestants say genetic therapy to reduce serious disease would be taking medical advances too far, as does a majority of black Protestants (56%) and white Catholics (54%). By comparison, four-in-ten Hispanic Catholics and 39% of unaffiliated adults say the same. There also are differences by religious observance on this issue; 61% of adults who attend church at least weekly say changing a baby’s genetic characteristics to reduce the risk of serious diseases would be taking medical advances too far while 45% of adults who attend church less often say this. Most Americans are accepting of bioengineering to create artificial organs, such as hearts or kidneys, for humans needing a transplant. Some 74% of adults say bioengineering of artificial organs is making appropriate use of medical advances, while 23% say this is taking medical advances too far. An overwhelming majority of religiously unaffiliated adults (84%) say the use of bioengineering to create artificial organs for humans needing a transplant is appropriate, as do 76% each of white mainline Protestants and white Catholics. Somewhat smaller majorities of white evangelical Protestants (68%), black Protestants (68%), and Hispanic Catholics (67%) say the same. Roughly two-thirds (67%) of adults who go to church at least weekly say using artificial organs for transplants is appropriate, as does a somewhat larger share of less-frequent churchgoers (78%). A multivariate logistic regression finds that neither religious affiliation nor frequency of church attendance is a significant predictor of views about bioengineered organs, when other factors are held at their means. The survey asked the general public whether they favor or oppose allowing more people access to experimental drugs before clinical trials have shown the drug to be safe and effective for that disease or condition. In all, 54% of adults favor allowing access to experimental treatments before they have been fully tested, while 43% oppose. 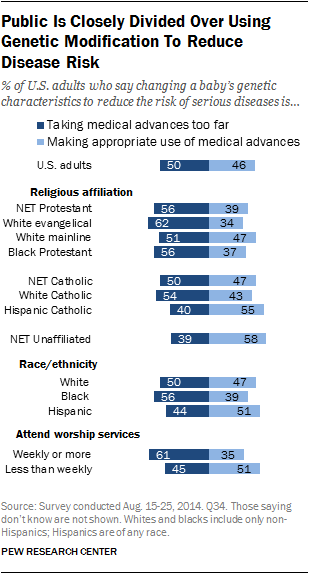 Black Protestants (60%), like black adults overall (61%), are most likely to oppose allowing more access to experimental drugs before clinical trials have shown the drugs to be safe and effective for that disease or condition. Views among blacks about this issue may be, in part, tied to a long history of racial disparities in treatment and access to health care. See Pew Research Center’s Fact Tank post, “Opinions on expanding access to experimental drugs differ by race, income,” for more. Frequent churchgoers are closely divided on this issue: 49% favor and 48% oppose access to experimental drugs. There is comparatively more support among less-frequent churchgoers; 57% of this group favors access to experimental drugs before they are fully tested. However, neither religious affiliation nor frequency of church attendance is a significant predictor of views on this issue with other factors statistically controlled in a multivariate logistic regression. Asked about whether vaccines for childhood diseases such as measles, mumps, rubella (MMR) and polio should be required or a matter of parental choice, 68% of U.S. adults say children should be required to be vaccinated. Three-in-ten adults say vaccination should be left up to parents to decide. 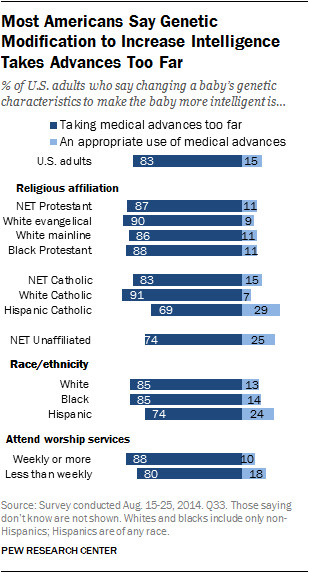 Hispanic Catholics (79%) and white Catholics (76%) are particularly likely to say that vaccines should be required. By comparison, fewer white evangelical Protestants (59%) say vaccines should be required; among this group, 39% say parents should be able to decide whether to vaccinate their children. Opinions on this issue are roughly the same among those who attend worship services more and less frequently. A multivariate logistic regression including religious affiliation and frequency of church attendance finds that evangelical Protestants (of any race) are less likely than the unaffiliated, when other factors are statistically controlled, to say such vaccines should be required. The Pew Research survey also asked the general population a handful of questions about genetically modified (GM) foods. The findings show a public largely wary of GM foods, with a majority saying such foods are generally unsafe to eat (57%), whereas 37% say such foods are safe. Further, most adults – 67% – express skepticism that scientists have a clear understanding of the health effects of GM crops, while 28% say scientists do. These beliefs are widely held across religious groups. Black Protestants are particularly likely to say eating GM foods is not safe (66% do so, while 23% say such foods are safe). This pattern is consistent with the views of blacks overall. The perspective that scientists do not have a clear understanding about the health effects of GM crops is widely shared among religious groups. Hispanic Catholics are less likely than other groups to say scientists do not have a clear understanding about this (55% do so, while 42% say scientists have a clear understanding); similarly, Hispanics overall are a bit less likely than either whites or blacks to say scientists do not have a clear understanding of the health effects of GM foods. Views about the safety of GM foods and perceptions of scientific understanding are about the same among those who attend worship services more or less frequently. A multivariate logistic regression model finds that neither religious affiliation nor frequency of attendance significantly predicts views on the safety of genetically modified foods when other factors are statistically controlled. Similarly, neither religious affiliation nor church attendance predicts beliefs about scientific understanding about the health effects of GM crops, controlling for other factors. When it comes to foods grown with pesticides, 69% of U.S. adults say such foods generally are unsafe to eat, while 28% say such foods are safe. A majority of all major religious groups say eating foods grown with pesticides is generally unsafe. Fully 83% of black Protestants, and 84% of blacks overall, say it is unsafe to eat food grown with pesticides. Hispanic Catholics (75%), like Hispanics overall (78%), are also particularly likely to say that foods grown with pesticides are unsafe. There are no differences in views on this issue by frequency of church attendance. A multivariate logistic regression including religious affiliation groups and frequency of attendance found neither factor significantly predicts views on this issue when other factors are controlled. Blacks are significantly less likely than whites to consider foods grown with pesticides safe for consumption, when other factors are controlled. Note that the regression model includes a factor for being an evangelical or mainline Protestant (of any race or ethnic background) and a separate set of factors for race and ethnicity. The general public is closely divided when it comes to the use of animals in scientific research – 47% of U.S. adults are in favor while 50% are opposed. Opinion on this question has shifted modestly from 52% in favor and 43% opposed in the 2009 Pew Research survey. By and large, religious groups are similarly divided over whether animals should be used in scientific research. Hispanic Catholics, however, are somewhat more inclined to favor using animals in scientific research (54%), compared with black Protestants (among whom 40% favor and 53% oppose such research). As shown in Pew Research Center’s “Americans, Politics and Science Issues,” there are sizeable differences between men and women on this issue. Men are more likely than women to favor animal research within most religious groups. However, Black Protestant and Hispanic Catholic men and women are closely divided on this issue. Half (50%) of people who attend worship services regularly favor the use of animals in research, while 45% oppose. Those who attend services less often tilt in the opposite direction, with 45% in favor and 52% opposed to animal research. A multivariate logistic regression including religious affiliation groups and frequency of attendance finds those who attend services regularly to be more likely to favor animal research, compared with those who attend services less frequently. There were no significant differences by religious affiliation in this statistical modeling once other factors are controlled.